Lemon lovers! These GLAZED LEMON BUTTER COOKIES deliver the perfect citrusy-sweet punch. They’re a great cookie choice all year long! I have to admit that I’m kinda excited that we’re finally into the spring season now – it is my favorite time of the year! I love watching everything come back to life after winter. If there is any food or flavor that reminds me of spring, sunny days and warmer weather – it’s lemon anything! I particularly love it when it’s in sweets – like cakes, pies – or these yummy and irresistible Glazed Lemon Butter Cookies! I’ll be the first to admit that I really don’t’ like making cookies … I hate feeling like I have to babysit food! Please, tell me that I’m not alone! 😉 However, when I know the outcome is as awesome as these cookies are, I will make the exception and happily bake up a batch … or two!! 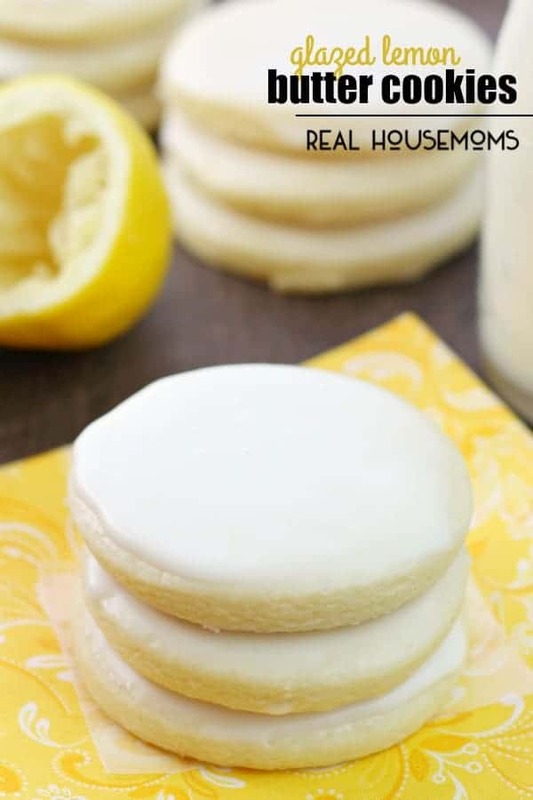 These Glazed Lemon Butter Cookies are cut-out cookies (as opposed to drop cookies) and if you’re familiar with Lofthouse-style cookies, these are soooooo similar in texture with a great lemon flavor! Instead of using fancy cookie cutter shapes – I just used my handy dandy biscuit cutter to make circles! Feel free to use whatever shape you like! Although I could have topped these little gems with a lemon frosting, I think the glaze is more appropriate for this cookie! It adds the perfect amount of citrusy-sweetness without being overwhelming to the cookie. Although I really dig these Glazed Lemon Butter Cookies during the spring and summer months, they are just as fantastic all year long! They will be a welcome treat in your cookie jar, for potlucks or any occasion you need a simple, crowd-pleasing treat! If you’re anything like me, you’ll find yourself coming back to this delicious recipe time and time again! Lemon lovers! These Glazed Lemon Butter Cookies deliver the perfect citrusy-sweet punch. They're a great cookie choice all year long! Bake for 8-10 minutes or until the edges just begin to brown. Allow cookies to cool for 3 minutes on the baking sheet before transferring to wire racks to cool completely. In a medium bowl, whisk together the powdered sugar and lemon juice until smooth. Dip each cookie top into the glaze. Return to the wire rack, glaze side up. Let cookies set until icing has set. If you enjoyed these Glazed Lemon Butter Cookies, be sure to check out my Lemon Lover’s Bundt Cake and Frozen Lemonade Pie! Both recipes are always a hit when we serve them to guests! Jamie, you have outdone yourself here. Wow! 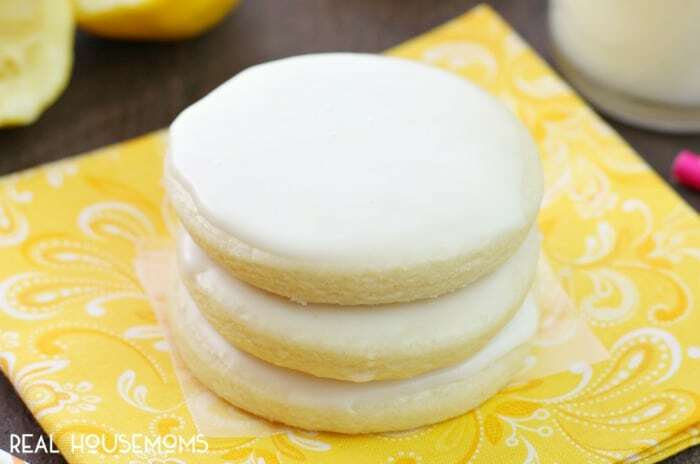 We love lemon cookies and these look awesome! PInning and yumming them for sure. I think I did something wrong. I made these tonight, gave them about 15 minutes to cool before doing the glaze and when I bit into one, it was a rock. I followed the recipe, but when I added the dry ingredients, it was really flaky, instead of doughy. Well, after being in the refrigerator, it stuck together better, but I’m thinking, should I reduce the flour a bit? Loved these lemon cookies! They were yummy even unfrosted. However, the recipe made almost 5 dozen, not the 2 dozen as stated. I used a 2 1/2 cutter. Also, letting the cookies cool on the baking sheet made it difficult to get off. After the second batch, I left the cookies on the sheet for less than a minute, to place on a cooling rack, and they came off much easier. Will definately make these again! I was wondering if these cookies can be made into a bar? Some recipes I’ve seen they say you can put the dough into a 9×13 pan and just cut into bars. If so would recipe be the same and also the time in oven? Thank you. These were delicious! The glaze dried clear and opaque in a strange pattern, I wonder how I could prevent that? This didn’t affect the flavour and I’ll definitely make them again.